MY NEW COUNTERTOP "BRICK OVEN"
Yes, I am now the proud owner of a Cuisinart BRK-200 Brickoven. What, you might ask, do I need with another gadget on my (small) kitchen countertop? Well, it wasn't just a whim-- I actually had a good reason! It was either get this or buy a new stove. We bought our stove about 1 1/2 years ago and it's great-- I love it. Except for making pizza. Unfortunately, we did not realize when we bought it that the "covered element" is not on the bottom of the oven, but in the back wall! For this reason, pizza, even on a stone, never gets golden-brown and a bit crispy on the bottom. This has been a source of frustration for me. When I read about this countertop oven with a brick lining that can handle a 12" pizza and lots more (and has convection), I decided to go for it. I made room on my counter by eliminating alot of junk and the small toaster oven. Our cupboards are at least 2 feet above the counter, so there was plenty of head-room. My first experiment after setting up the oven was roasted asparagus, which I forgot to take a picture of. But, it was delicious! The oven heated up quickly and I'm sure it takes alot less energy to cook a pan of asparagus in this .9 cubic ft. space than in my 30" oven! As you can see, I baked it right on the stone. I preheated the oven to 500 degrees F for 30 minutes (it takes a while for the stone to absorb all the heat). I made three 12" pizzas out of my dough recipe. The first one was a little dry, I thought, so I turned it down to 450 degrees F and the next two were great! The pizza bakes in 7-8 minutes. I roasted fruit and vegetables for a new salsa recipe for the upcoming Vegan Feast newsletter. 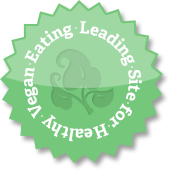 I made vegan coconut macaroons for the upcoming Vegan Feast newsletter. Oven-frying marinated tempeh slices in a crispy coating for the upcoming Vegan Feast newsletter. Oven-frying tofu slices for Japanese Noodle Soup. The oven (without the stone) will heat up to 350 in 4 minutes, and 450 in 6 minutes. I figure this will be a big savings in electricity when doing small batches of this and that. But you can fit a large pie pan in the oven and I'm sure I can do a casserole, a seitan roast, a pan of brownies, etc., in it. For just the two of us, I think I'll be using it every day. For large family gatherings and dinner parties, I'm sure it will come in very handy as an extra oven! For oven-frying food items and roasting vegetables to avoid using alot of oil it will be great-- no guilt about firing up the big oven! So far, I'm loving it-- no regrets! It's easy to use and many of my pans and casserole dishes fit in it. Next on my list to try is a loaf of crusty bread, which I'm told it does really well right on the stone. (Another recipe here.) And I have a perfect-sized cast iron pot in which to try the crusty no-knead bread in my new oven, too! Here's a spicy tofu dish that is simple and quick to make, and you can make it as spicy as you like-- this dish is from the Hunan province of China, where they like it hot! Hunan food is characterized by its hot and sour flavor, fresh aroma, greasiness, deep color, and the prominence of the main flavor in the dishes. 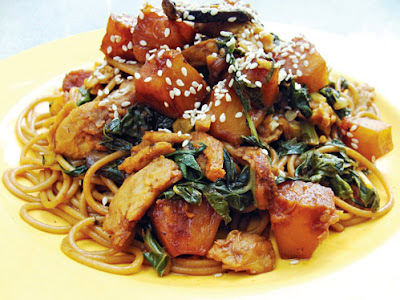 Hunan food is hot because the climate is very humid, which makes it difficult for human body to eliminate moisture. The local people eat hot peppers to help remove dampness and cold. The main cooking methods for Hunan dishes are braising, double-boiling, steaming and stewing... Rice is the staple in Hunan, but northern-style side dishes and fillers are also popular: bean curd "bread" rolls or dumplings and savory buns. 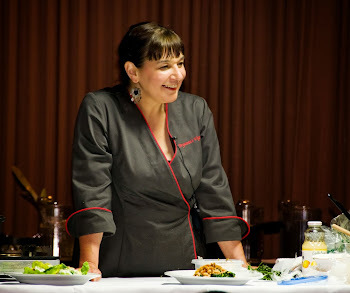 They are further signs that Hunan is one of China's culinary heartland, incorporating many flavors and regional influences." There is a longer piece here. I adapted this dish to be vegan, and also pan-fried the tofu in a nonstick pan with just a little oil, instead of deep-frying it. I left out some of the extra oil at the end of the recipe, too, and used a little more soy sauce. We really enjoyed this! Adapted from a recipe in the "Revolutionary Chinese Cookbook: Recipes from Hunan Province" by Fuchsia Dunlop. In a bowl, combine the seitan and wine. Mix well and set aside. If you aren't using the seitan, add the wine to the stir-fry later, along with the soy sauce. Cut the tofu into oblong slices, about 1/2-inch thick. Pat dry. In a large nonstick skillet or stirfry pan, heat the oil over high heat. Add the tofu and fry until the slices are just tinged with gold on both sides. Drain on paper towel and set aside. Add the garlic and chilies to the hot pan and let them sizzle for a few seconds until fragrant. 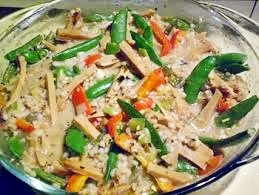 Add the seitan, if using and stir-fry it briefly. Add the black beans, still stirring constantly. Pour in the broth and soy sauce. Add the fried tofu and bring to a boil. Lower the heat and simmer for 3 minutes. Stir in the cornstarch mixture and sesame oil and toss with the ingredients briefly, just until the sauce thickens. Taste for seasoning and add more soy sauce, if you like. Sprinkle with the green onions and serve with rice. Nutrition (per serving): 202.3 calories; 59% calories from fat; 14.0g total fat; 0.0mg cholesterol; 630.0mg sodium; 421.7mg potassium; 9.3g carbohydrates; 2.3g fiber; 2.5g sugar; 6.9g net carbs; 12.9g protein. Last night I felt like having a light, Asian-style noodle dish, and I had a few ingredients that needed using-up-- namely, some sliced chard, what was left of a fresh pineapple, and two portobello mushrooms that wouldn't last too much longer. I also wanted something high in fiber and low in fat. Fresh Pineapple-Noodle Stir-Fry is what I came up with and it was delicious! 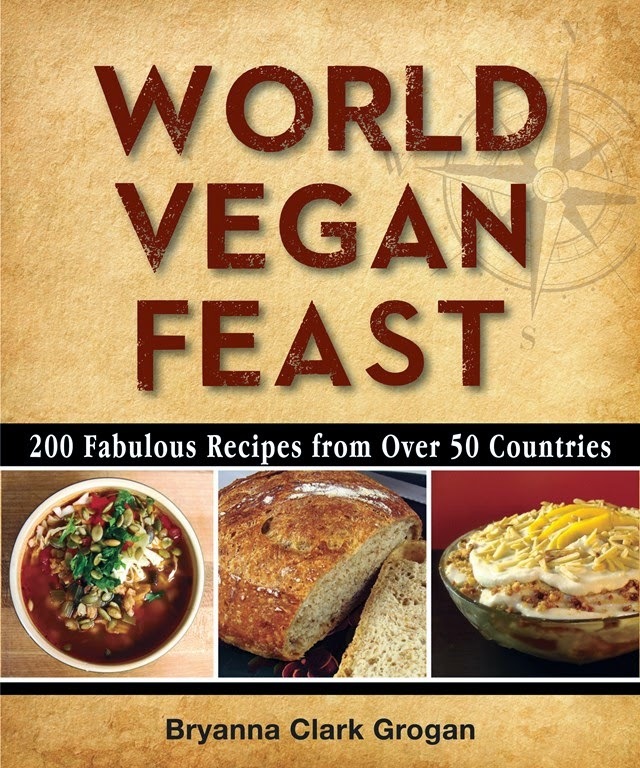 UPDATE: The recipe is in my book World Vegan Feast. To tell you the truth, I haven't used fresh pineapple that often before, but now we can get fresh organic pineapples for a decent price, so I've been buying one now and then. I'm experimenting with some fresh pineapple recipes for my (update: now defunct) quarterly newsletter, the Vegan Feast, which is why I had some left over. Even though fresh pineapple can be very sweet, it also has a tartness that canned unsweetened pineapple doesn't have, making it a great addition to a savory dish such as the one below. For the protein component in this dish, I used Soy Curls™, which I reconstitute in hot chicken-style veggie broth (I use equal measures dry Soy Curls™ and broth). 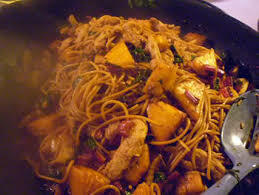 However, in this dish you could use strips of any chicken-style vegan meat analog, including seitan; or Yves, MorningstarFarms, LightLife, or President's Choice stir-fry style "chicken" strips; or grilled or fried tempeh strips; or strips of baked seasoned tofu. 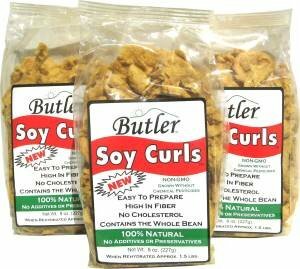 "Soy Curls are a delicious natural, delicately textured product made from 100% whole soybeans. The exquisite flavor results from a special process of lightly cooking, and texturing. Soy Curls contain the natural goodness of the soybean including all essential amino acids. Soy Curls are high in fiber, easy to prepare, no cholesterol and contain the whole bean. Non GMO, grown without chemical pesticides." When reconstituted in hot broth (which takes only 5 minutes or so), the strips are like tender chicken (though you could flavor them differently). 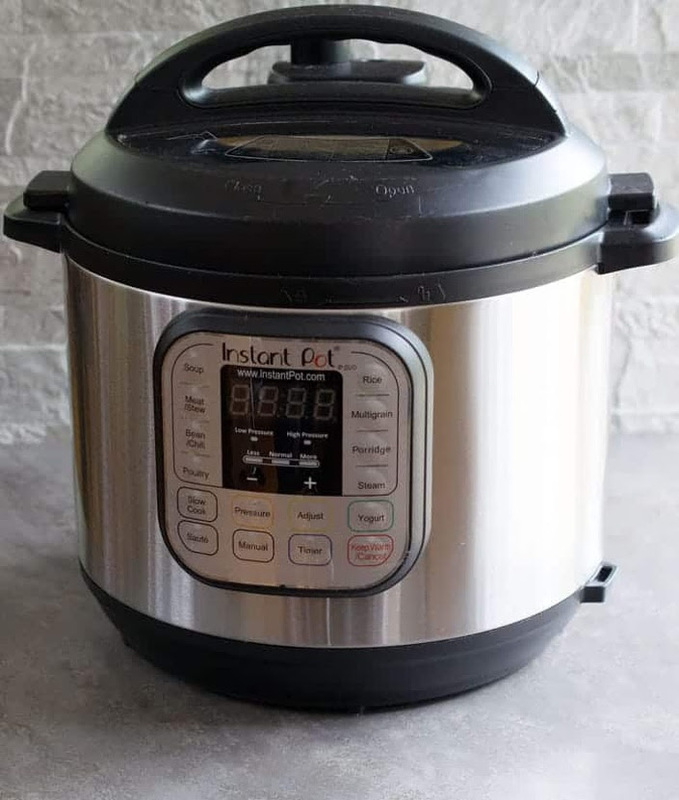 (I usually reconstituted more than I am using at that particular time and freeze the remaining for really quick meals.) They are very versatile and wonderful for stir-fries, casseroles, etc.. You will see a number of recipes I have developed for them on this blog (Update: and in my book, World Vegan Feast). Because I have to order them by mail, I buy them in bulk, in a 12 lb. box, which I usually split with a friend. I only have to order them 2 or 3 times a year. You can find out where to buy them online and in Canada,the USA, the Caribbean, and in Europe on this page. amazon.com carries them in a variety of sizes and bags, and even the "crumbs, which can be used like TVP granules (here's a recipe using them), or you can order them right from Butler Foods. Most Seventh Day Adventist stores sell them in bulk. Happy New Year, everyone! I'm hoping for a year of peacemaking and global justice-- not to much to ask, I don't think! Anyway, I hope you had a lovely holiday. Ours was noisy and fun-- all my kids and their families, my mother, my sister and family were here, though I didn't have to do all the work! I want to give you my version of a recipe from Cooking Light magazine that I veganized last night. 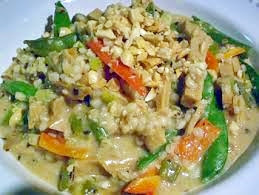 It's perfect after the excess holiday food-- spicy and interesting, but wholegrain and full of vegetables. (PS: I'm happy to report that I did not gain weight over the holidays-- not sure how I pulled that off!) I also added my microwave instructions, so that you don't have to stir so much! We really enjoyed this dish. Heat 1 1/2 teaspoons of the sesame oil in a medium saucepan over medium-high heat. Add 1/2 cup of the green onions and 1 tablespoon garlic; sauté 1 minute. Stir in the barley, 1/4 cup cilantro or basil, black pepper, 1/2 cup broth, the sherry, and jalapeños; bring to a boil. Cook 3 minutes or until liquid is nearly absorbed, stirring constantly. Add remaining broth, 1/2 cup at a time, stirring constantly until each portion is absorbed before adding the next (about 15 minutes). Combine juice and next 5 ingredients (juice through curry paste); set aside. Heat remaining 1 1/2 teaspoons of sesame oil in a large nonstick skillet over medium-high heat. Add remaining 1 cup green onions, 1 tablespoon garlic, lemongrass or zest, and ginger; sauté 1 minute. Add "chicken", bell pepper, and peas; sauté 2 minutes. Stir in barley mixture, juice mixture, and coconut milk; bring to a boil. Reduce heat; simmer 5 minutes or until sauce thickens, stirring occasionally. Stir in 1/4 cup cilantro or basil. Sprinkle each serving with 1 teaspoon peanuts. MY MICROWAVE VERSION: I used a 2 qt. Pyrex round casserole dish. I "sweated" the 1/2 cup green onions and 1 Tbs garlic in the oil for a couple of minutes (covered) in the microwave. Then I added the barley, basil (or cilantro), 3 cups broth (yes, all at once! ), sherry, and jalapeños. I microwaved this on high, UN-covered, for 7 minutes. I stirred it and microwaved it for 7 more minutes. I sauteed the remaining green onion, garlic, lemongrass (or zest, as in my case), and ginger for a few minutes in a nonstick skillet. I added the red pepper, "chicken" sub, and peas and sauteed briefly. Then I added it to the casserole after the last 7 minutes of microwaving, along with the lime juice mixture and the coconut milk. I microwaved it for about 5 minutes more-- it depends on how "soupy" or "dry" you like your risotto. Nutrition (per serving): 352.1 calories; 32% calories from fat; 13.0g total fat; 0.0mg cholesterol; 295.6mg sodium; 501.3mg potassium; 43.2g carbohydrates; 10.0g fiber; 10.4g sugar; 33.2g net carbs; 15.4g protein; 7.3 points. Nutrition facts if you use Bryanna's Mock Coconut Milk instead of lite coconut milk: Nutrition (per serving): 340.4 calories; 28% calories from fat; 10.8g total fat; 0.0mg cholesterol; 346.8mg sodium; 572.1mg potassium; 44.1g carbohydrates; 10.3g fiber; 11.9g sugar; 33.8g net carbs; 15.7g protein; 6.9 points. Have a Happy, Healthy and Peaceful 2008!